Excellent piece. It’s still functional and working since 2013 purchase. 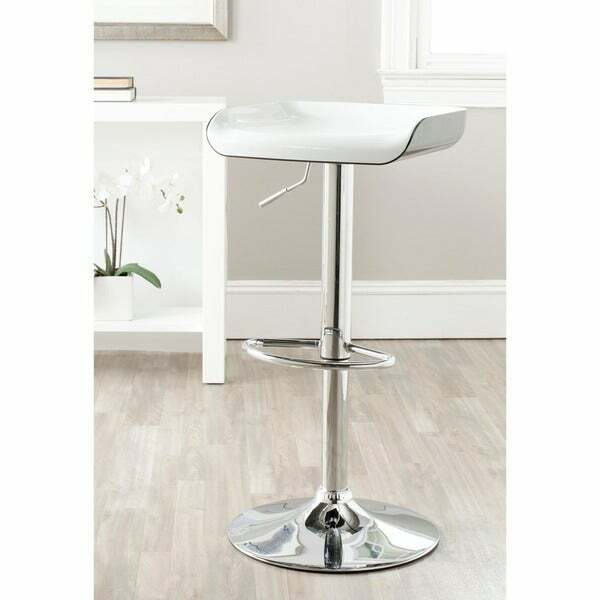 The Rameka bar stool's sleek steel chrome detailing and white shiny white ABS swivel seat make the ups and downs of daily living a breeze. Crafted with gas lift seat that adjusts from 23.6 to 32.1 inches, Rameka is an elegant combination of contemporary style and classic lines. Dimensions 24.8-33.5 in. H. x 16.1 in. W. x 16.1 in D.
Comfortable for bony and fat asses. My granddaughter messed up the adjustable height mechanism on one, so they are not completely indestructible. Very attractive addition to kitchen. Photo does not represent color. These stools seem to be great, EXCEPT they are not white. The seats are white on top and black on the bottom. This is not clear from the photo/description and the goes against what is written in the Q&A section. Overstock customer service has been great and they are taking care of the return, but I wanted to alert anyone else about this to avoid the issues I've had. Easy to installed and look really good. I am very please with my new Safavieh Rameka Stool. It arrived at my appartment at good condition, box well packed and strong. I will order some more to completed my sets. Looks good!!! quality just okay, not that good, not that bad. "On the outside portion of the seat, can you please tell me the color. Looks like it could be white or silver/chrome. Do you have any other pictures? Thanks." Hello lingula, we appreciate your inquiry. Unfortunately, this is the only picture we have of this item. We can confirm however, that the item is white on the outside portion as well. We hope you have found this information helpful. Thank you for shopping with us. Have great day! "Is it white or black? Image is white, but description saids black. Which one is right??" Hello onefineday72, we appreciate your inquiry, and apologize for the confusion. This item is white. The product page will be updated accordingly. Thank you for bringing to our attention and shopping with us. Have a great day! "What is the maximum weight it can handle?" Hello kd1127, Overstock does not weight test items. Thank you for shopping with us, and have a great day!